Unity In The Community, Happening… Right Now! This article is 3276 days old. Daniel Bombardier, more commonly known as [email protected], is celebrating his shop’s first year in business in Downtown Windsor. The Printhouse, located at 510 Pelissier Street, is one of several shops currently surrounded by piles of gravel and herds of backhoes due to the streetscape project underway. So the party’s going on in the back! 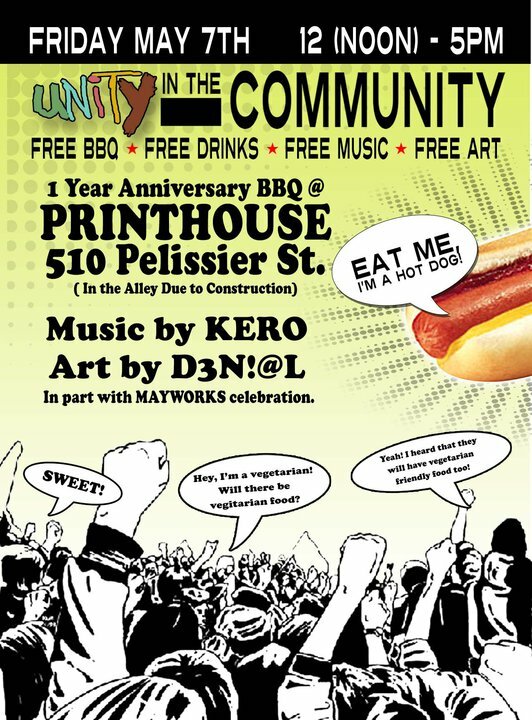 The alley behind the shop will fill up with friends of the Printhouse, and supporters of all downtown local business, for some FREE BBQ, FREE drinks, FREE music and FREE art. Did I mention this is all FREE? Join us for some Unity in the Community!